"The authoritative volume on how to cook with cannabis." --Michael Ruhlman Herb: Mastering the Art of Cooking with Cannabis offers over 200 pages of gorgeously illustrated recipes that elevate the art and science of cooking with cannabis. Chefs Melissa Parks and Laurie Wolf have developed recipes that specifically complement and downplay the taste of the herb so that each appetizer, entree, and dessert will be enjoyed to the fullest. No special culinary equipment is needed; home cooks can simply prepare an "extraction"--an infusion of cannabis into a medium such as oil or butter--then proceed as normal with the recipe. Seasoned chefs and cooking novices alike will revel in creating homemade cannabis-infused treats with these delicious, reliable recipes. Discover expert tips on creating consistent and potent canna-butter, canna-oil, and canna-olive oil. Gain a better understanding of dosing levels and popular marijuana strains. Enjoy the art of at-home cuisine in an entirely new way with the first cookbook to treat the humble cannabis herb as the unique culinary ingredient that it is. "As cannabis moves into the mainstream--and into the kitchen--we now have the first authoritative volume on how to cook with it. Not only does Herb cover the whole recipe spectrum, from appetizers to desserts, it has the first concise descriptions of creating fairly specific dosing levels, the hardest part of cooking with cannabis. This is a unique culinary resource and a valuable addition to our collective cooking library." --Michael Ruhlman, Bestselling Author of Ruhlman's Twenty, Charcuterie, and The Soul of a Chef "Foodies rejoice! 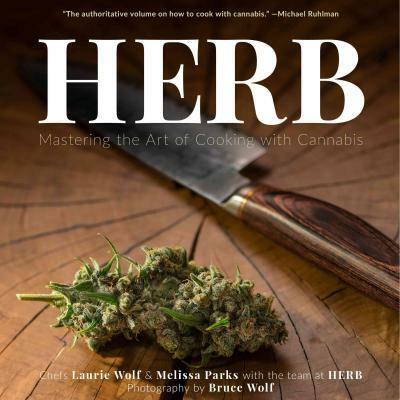 Herb is a gorgeous cannabis cookbook for those of us who care about the food as much as the medicine." --Cheri Sicard, Author of Mary Jane: The Complete Marijuana Handbook for Women "Well-written, beautifully photographed, and packed with useful information, Herb has arrived right on time. Full of fun recipes that I'm excited to cook, Herb has already commanded a favorite spot in my cookbook collection (on a higher shelf)." --Laurence Jossel, Chef and Partner at Nopa/Nopalito "Your grandmother told you to eat your greens! Herb shows you how to get the most out of cannabis in your kitchen, and follow your grandmother's best advice." --Chris Kilham, Founder of Medicine Hunter, Inc.